Iker Pou su "Solo per vecchi guerrieri"
Super via di Manolo opened completely from below and then later released with difficulty up to 8c + / 9a in the 4th shot. 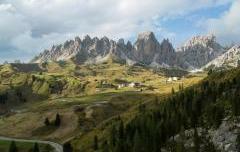 This is certainly the most difficult climbing route in Italy and in Europe it is only surpassed by Orbayu (8c + / 9a, Naranjo de Bulnes) and at the same level of Silbergeier (8b +, Rakiton) and WuGu (8c, Rakiton). The first two pitches (7c + and 7c) were opened and freed already during the first ascent and in self-safety while the last 2 were released in August with difficulty, the first of 8b / b + and the second, which corresponds to the fourth and last throw, of 8c + / 9a. The road climbs without overhanging by a meter and the two final pitches, as well as the farthest ones are protected with very distant split, they are very spectacular because they take place on a wall and with very few notches very small and distant from each other all in extension and with feet in adherence. 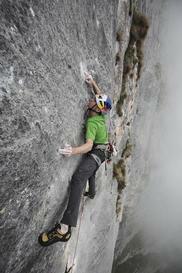 Until now there have been very few repetitions all by roped formed by the world and Italian climbing elite. Maurizio Zanolla e Federico Gorda . N. Pitch Name Description Level Mandat. Gr. Note: Il tiro più facile di tutta la via e la gradazione è sempre strettina . Gr. Note: Gradazione giusta ma tiro estremamete complicato e difficile . Gr. Note: Forse è 8c/c+ ma vista la posizione la posizione del tiro e la distanza degli spit la gradazione giusta è 8c+ molto duro .